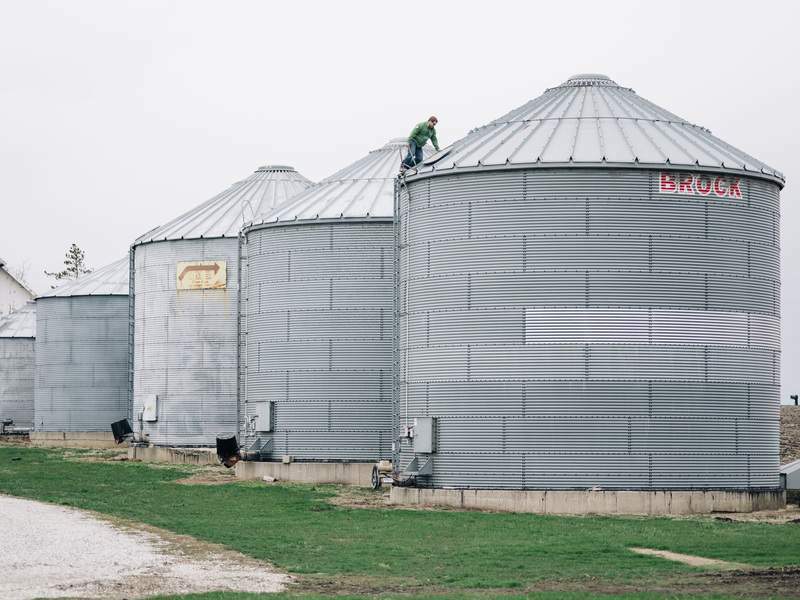 Washington Post Ryan Rippy of Crawfordsville checks on grain levels at his farm this month. Rippy felt pressured to purchase a $50,000 storage bin before steel tariffs pushed the cost up several thousand dollars. Ryan Rippy had been haggling for almost three months over the price of a new storage bin when he felt the pinch of President Donald Trump's trade offensive. The contractor told Rippy he needed to order the 30-foot structure immediately or see its roughly $50,000 price swell, perhaps by $5,000, thanks to a tariff on imported steel that the president imposed last month. Already facing the possible loss of $200,000 in crop sales to China, irked by another round of Trump tariffs, Rippy signed the paperwork. 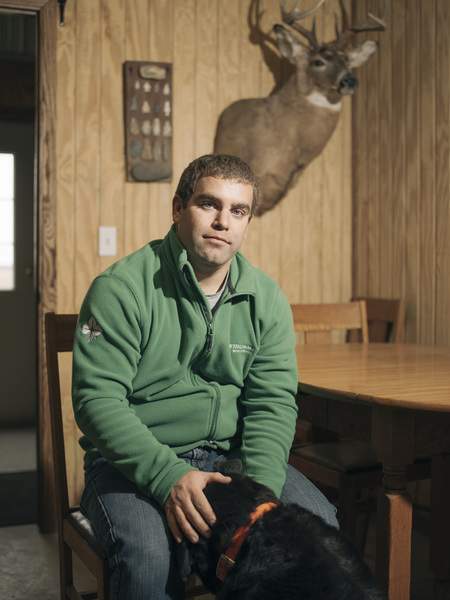 A trade war is bad news for farmers like Rippy, 31, who raises soybeans, corn and cattle on a 1,500-acre farm outside this central Indiana town. 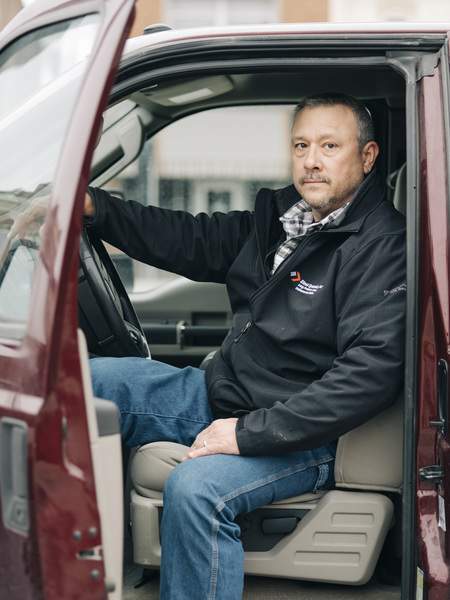 But it's good news for his father-in-law, Barry Burkhart, 50, a millwright in a local steel plant, whose job could depend upon the tariffs keeping steel prices high. As Washington and Beijing swap threats in their escalating trade dispute, this Indiana family shows how global commerce is marbled through communities across the country. Local residents compete with, sell to, and work for foreign enterprises, a reminder that in trade wars, it's hard to shoot at the enemy without hitting a friend. Two products at the center of the trade conflict, steel and soybeans, determine whether this area prospers. No other Indiana county produced more soybeans last year than Montgomery County's 7.6 million bushels, according to the U.S. Department of Agriculture. No company employs more local residents than steelmaker Nucor, which has about 750 workers in a mill located amid cornfields outside of town. As a result of its agricultural and manufacturing base, the surrounding county is among the one-fifth of U.S. counties that are most vulnerable to retaliatory Chinese tariffs, according to calculations by Mark Muro, a senior fellow at the Brookings Institution. Trump in recent weeks has moved aggressively to implement his “America First” trade policy, intended to return millions of lost manufacturing jobs to the United States. But by imposing tariffs on solar panels, washing machines and industrial metals – and threatening to erect barriers to $150 billion in Chinese products – the president is protecting some Americans while exposing others to higher prices or to retaliation by U.S. trading partners. The trade skirmish with China began with Trump acting to limit imports of steel and aluminum citing national security considerations, but has expanded to include potential tariffs on a total of $150 billion in Chinese electronics, aerospace parts and machinery. China has responded by threatening its own import taxes on U.S. products, notably including soybeans, corn and pork. For farmers, the punch and counterpunch threaten to raise their costs and cut their sales. Although the president later exempted two-thirds of global steel imports from the tariffs, the levies still mean higher prices for the Rippys' new 15,000-bushel storage bin and for equipment like the new combine they're considering buying this year. Those giant machines, which harvest grain crops, cost more than $500,000, so an increase of even a couple percentage points means thousands of dollars in additional costs. China buys 61 percent of U.S. soybean exports, and more than 30 percent of overall U.S. production. Just the threat of an interruption in Chinese soybean orders sent commodity prices plunging and disrupted the family's effort to sign contracts for next year's crop. Global issues have shadowed Rippy Farms since Ryan's father, Howard, 61, raised his first crop in 1980, the year President Jimmy Carter imposed an embargo on grain sales to the Soviet Union following its invasion of Afghanistan. That may explain why the elder Rippy is more sanguine about the tariff threat than his son. The wet, cold weather that has delayed the spring planting already had Ryan Rippy on edge before the tariff announcement. His dad offers a reassuring perspective: The ex-businessman in the White House talks a tough game as part of a negotiating strategy. “I'm just not convinced that everything he's threatened will happen,” Howard Rippy said. Responding to cries of worry from farm-state Republicans, Trump has ordered Agriculture Secretary Sonny Perdue to develop a plan to protect farmers from retaliation. Last week, the president repeated his promise of help, saying “farmers will be better off than they ever were” after enduring some short-term financial pain. No one in Crawfordsville is sure what that will mean, but some are wary of additional government intervention in their market, even if it's designed to help them. “If they do something for farmers, how fair is that to the retailers and the other industries?” Howard Rippy said. Right across the street from the Ceres Solutions farmer cooperative, where Ryan Rippy and his dad purchase truckloads of fertilizer, fuel and seed, stands the Nucor mill, which has a giant American flag along one side. The steelmaker last year sought Washington's protection, complaining that state-subsidized Chinese mills are flooding global markets with low-priced steel, contributing to the loss of manufacturing jobs and the erosion of Nucor's customer base. Nucor maintains a no-layoff policy, but inexpensive imports have cost domestic producers sales and reduced some of their output-linked pay. “It has lowered production and clearly affected the teammates out there,” said Dickerson, referring to China. But Burkhart, whose fortunes have risen and fallen with the steel industry over the last 20 years, is cheered by signs that Trump's tariffs are spurring steel production. U.S. Steel and Republic Steel are reopening shuttered Midwestern mills in Illinois and Ohio. He likes that the president is making tough decisions and standing up to China.